Navigate to the 'EDIT PAGES' screen for your App (see the 'Navigation Path' at the top left of the image above). Select the 'Score Card' page that you wish to edit from the page-list and click 'Edit' (as shown above) to open the individual page for editing. Note: All iCaddy App templates come with two 'Score Card' pages (by default). One 'Score Card' page is provided for Players 1 & 2 and a separate 'Score Card' page is provided for Players 3 & 4. Additional 'Score Card' pages can be added if required. All 'Score Card' pages are edited the same way (described below). 'Email': Add an optional destination email address in this field for players to send their scores to. This feature is accessed by the App-user via the 'share' function (available on the Score Card page) on their device. 'Hole', 'Player 1' & 'Player 2': These fields reflect the information displayed across the top row of the 'Score Card' page (as indicated in the example Handset Display shown above). These fields can be edited as required, however we recommend leaving these fields unchanged. 'Par': The 'Par' field is also displayed across the top of the 'Score Card' page (as indicated in the example Handset Display shown above). The 'Par' field in the blue box has a default (Mens / Ladies) setting (e.g. Par M/L), however this can be edited to simply indicate 'Par' if preferred. 'Total': The final field in the blue box is the 'Total' field. This field is displayed at the bottom left of the 'Score Card' page on the device. The default text for this field is 'Total Score'. Edit this field to indicate 'Total', if preferred. Green Box: The 'Total Par' field, should be edited to reflect the Total Par value for your course. The 'Total Par' field has a default (Mens/Ladies) setting (e.g. 70/72 as shown in the handset display above), however this field can be edited to reflect a standard (singular) 'Total Par' score if preferred. Note: The editability of our 'Score Card' pages means that both Men and Ladies can use the same Score Card in the App. Alternatively, Club's can set up separate Score Cards for Men and Ladies if preferred. Orange Box: Each 'Score Card' page is set up with 18 holes by default. Each hole is listed in the 'Hole Items' section. Each 'Hole Item' reflects a horizontal row on the 'Score Card' page. Clubs can add or remove holes as required (via the + or - buttons located beneath the 'Hole Items' section). Select a hole in this field to edit the corresponding par value for that hole in the 'Par' field (located in the purple box as described below). Red Box: The 'Hole Property' section includes the 'Field Item' and 'Item Name' cells. Field Item: The 'Field Item' information corresponds to the 'Hole Item' selected above (e.g. Hole 1). This field does not require editing and should be left unchanged. Item Name: The 'Item Name' field reflects the number of the hole (i.e. the text which is displayed in the 'Hole' column down the left side of the 'Score Card'). The 'Item Name' for 'Hole 1' is '1', the 'Item Name' for 'Hole 2' is '2', and so on. These fields do not require editing and should also be left unchanged. Purple Box: The 'Par' field in the purple box reflects the par value for each hole . Each 'Par' field should be edited to reflect the par value for each hole on your course (e.g. if Hole 1 is a Par 4, enter '4' in the 'Par' field as shown above). The 'Par' value for each 'Hole Item' (i.e. 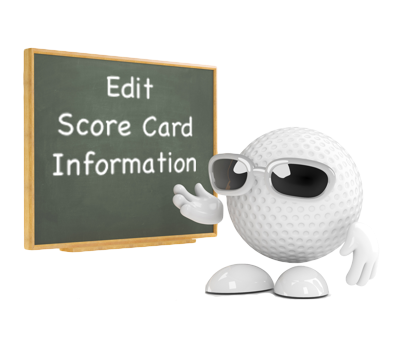 each hole) should be edited individually as required to match your Club's existing score card. Note: The 'Par' field in the purple box (like the 'Total Par' field described above), also has the ability to reflect Mens/Ladies par values for an individual hole (e.g. 4/4 as shown above), however this field can be edited to reflect a single par value for each hole if preferred. The background design and/or text color for each 'Score Card' page can be edited as required. To edit these features, click 'style' for the respective 'Score Card' page (as shown above). 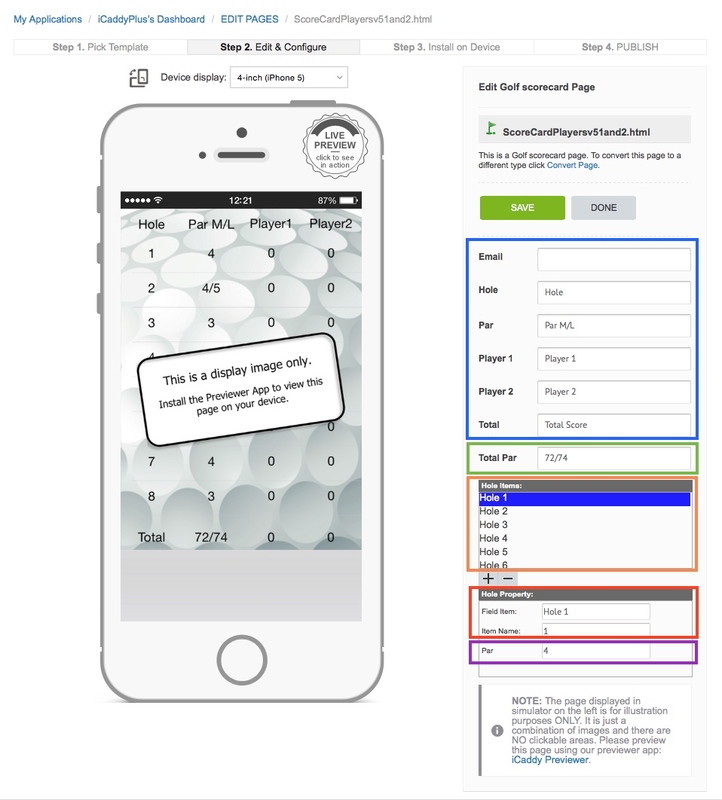 The 'Design style Pages' screen will appear (as shown in Step 4 below). The 'Design style pages' screen allows you to edit the 'Background image', the 'Background color' and the 'Text color' as preferred. Setting a 'Background color' is the simplest way to customize a 'Score Card' page for your Club. A 'Background image' is not mandatory. Using both a 'Background color' and a 'Background image' on the same 'Score Card' page is not recommended. Choose only one of these design options for each Score Card. Be sure to choose an appropriate 'Text color' to contrast clearly against the preferred background design. 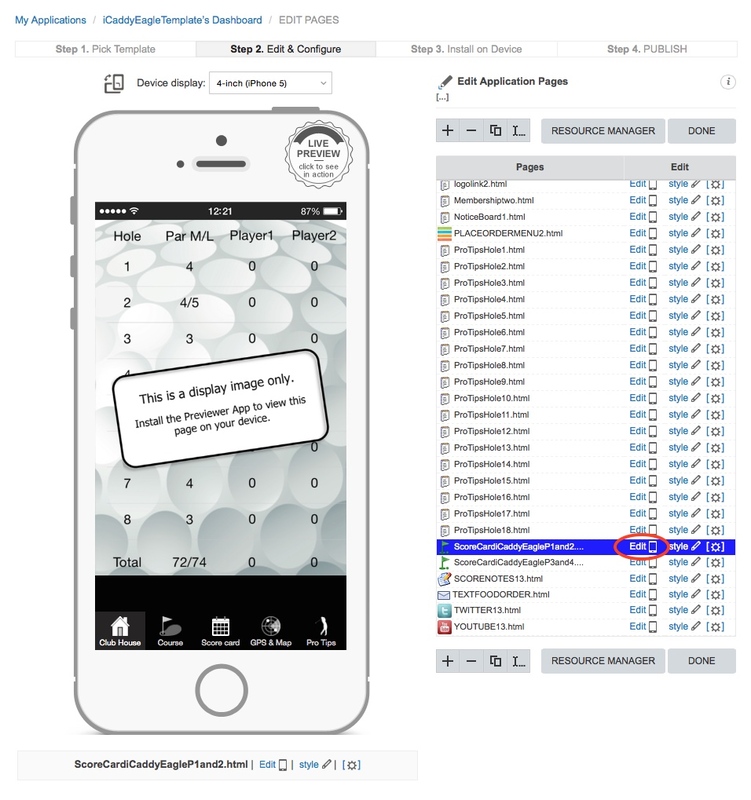 To edit the 'Background Image', click on the small grey square button (located on the right hand side of the field), then select the required image from the 'In-App Resource Manager'. Refer to How to Add a File to 'In-App Resources' for more information on how to upload files used throughout your App (e.g. an image file such as a .png, or .jpg file). To edit the 'Background Color', follow the same procedure then select the required color from the palette provided. Note that a HTML hexidecimal color code (e.g. #FFFFFF) can be typed directly into the 'Background Color' field, if preferred. To edit the 'Text Color', follow the same procedure then select the required color from the palette provided. Note that a HTML hexidecimal color code (e.g. #FFFFFF) can be typed directly into the 'Text Color' field, if preferred. Note: If you have chosen the Android target platform for your primary App, do not select black (#000000) for the text color. Android devices typically display a black background cell when the App-user edits a field on their device (e.g. when entering a score, or entering a Player's name). To ensure the text is visible for Android users, select any color (other than black) to contrast against the black background cell displayed by default on most Android devices. If building your primarty App for the Apple target platform, setting the text color to black is fine, however the text color must be changed on the Adroid version of the App (after converting the App from Apple to Android). For further information about converting your App, see How to Convert Your App's Platform. Click 'SAVE CHANGES', then click 'DONE' to return to the 'EDIT PAGES' screen for the selected Score Card page. Note: After the above changes have been applied, these changes will not be displayed on the Handset Display (as depicted in the Steps 1-3 above). The image shown on the Handset Display on your computer is a default static image only. Please preview edits to 'Score Card' pages by using the iCaddy Apps Previewer. For more information on using the Previewer App, go to How to Download the iCaddy Apps Previewer and How to View Your App on the iCaddy Apps Previewer. Contact iCaddy Apps for any assistance with setting up 'Score Card' pages for your Club.